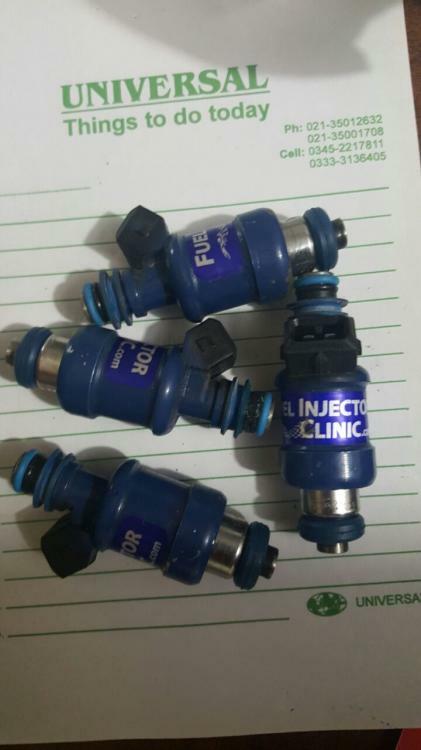 i do not have the injector data because i found these injectors used ones i need injector dead time table and the short pulse adder table to run the car properly. i already have the injector resistor pack for low impedance injector. attached the injector picture below . do you mean 3sgte oem resistor pack wont work ? do i need another one ? if yes then which one ? my FIC 1450cc injectors are 2.2 ohms any help ? and what about short pulse adder data and dead times table ? currently i am just unable to use my injectors so i had to switched to oem injectors. I'm unsure what the resistance of the OEM ST205 ballast pack is, probably easiest to measure it with a multi-meter. Without the deadtime and short pulse width data there is no 'correct' solution. If it were me and I couldn't find the data I would try and determine the approx deadtime values and enter this. You could do this by using the 'Adv Test Inj 1' injector test function of the ECU. Reduce the Test Inj PW until you see the injector no longer spray. To do this for the different voltages you will need an adjustable power supply unit. While the results from this will not be super accurate, they will be better than nothing. I would put 0.0 everywhere in the short pw table. ST205/gen3 3sgte balast resistor pack should be just fine as the OEM injectors are around 4.5 ohm.